Most stories are about the Hero. This is not one of those stories. No, this story is about the Sidekicks. You know, the guys who actually do all the work, but get little of the credit? It all started when the Mysterious Madam Quazzirel had sent your hero, Dangerous Dave, an invitation. It was a plea for help. The realm was in dire need of saving, and only one hero was brave enough, had a large enough reputation, and had enough sidekicks to get the job done. That was Dangerous Dave. So, the party traveled to the coastal town of Melboring, where little exciting ever happens, to meet the Madam. The night before their meeting, Dangerous Dave did what he usually does. He headed out to the local tavern to gather information, party, go carousing, spread rumors of his grandeur, or whatever else he did on the town during a night out. Nothing was out of the ordinary here, until the morning time came and Dangerous Dave was nowhere to be found. This will be a relatively short (one-shot if played in person) adventure. The goal is to find out what happened to Dangerous Dave, and rescue him. No immediate plans for anything after that, though if everyone is enjoying the game, that may change. This will not be your normal character application process, and this is the point where this adventure will differ quite a bit from most D&D 5E games. Rather than having normal class/race characters, all PCs will be using the Sidekicks UA article. That's right! Anything in the published materials (PHB, MM, Volos, ETC) with a CR rating of 1 or lower can be your base. In the case of beasts, or plants with a low INT score, that do not speak a language, we can assume that they have been enchanted by the 'Awaken' spell prior to, or after becoming a Sidekick. You will then get 3 levels in your chosen Sidekick class, Warrior, Expert or Spellcaster. - Character Image: Show me your character. Do they wear a special sidekick uniform, or have a special symbol? Are they just so mediocre that they blend in with everyone else? Perhaps they are so exotic already, that no embellishments are needed? Original artwork please, as opposed to googling something and copying it. Even if you draw like a 5-year-old, we won't judge here! If you need some inspiration, I put together a tutorial for the minimum standard here. I am looking for an unspecified number of players (depends on interest), looking to close applications on January 14th. Last edited by Bhelogan; 01-10-2019 at 10:10 AM. Appearance: Vyniris stands at about 4'11" and 90 lbs. She is rather small framed with lean muscle and little body fat, a perfect build for the strength needed to gain lift while staying light enough to be able to soar. Besides large grey wings, dagger sharp talons, and pointed teeth she looks like any young female humanoid. Vyniris likes to wear tough, form fitting clothing that offers minimalistic protection from the elements. She wears her long, brown hair down or in a ponytail, preferring to rely on the wind to sweep it out of the way when she's swooping down on prey. Her skin is a light caramel color, tanned caucasian, from plenty of time flying too close to the sun. Perhaps her most outstanding quality is her sing-song voice. Such melodic sounds are generated from behind her lips, that many times she can make a man forget about the claws and the teeth and see only an angel in disguise. Backstory: Vyniris was born in the eyries of the far north. She lived like most fledgling harpies, devouring the raw flesh of any barbarians or mountain sheep that wandered into the clever trap of her winged mothers. One warm morning, an adventuring party of angry sheepherders led by none other then Dangerous Dave summited the mountain and vanquished all but one of the harpies from the rock. The mob of avenging villagers would have certainly killed her too, if it wasn't for Dangerous Dave taking an odd liking to the poor creature. Whether it was to be humorous, or whether he truly believed such a monstrosity could be reformed, he sent the savage child to be raised by clerics in a monastery. Vyniris never quite caught on to the ridiculous teachings of the acolytes that brought her up, often choosing the freedom of the skies over the stuffy classroom and hunting rabbits instead of partaking in proper meals. She actually proved to be quite an airhead, caring more about shiny objects and singing songs then learning even simple books. Still, they managed to teach her right from wrong...you could never say there was not at least one harpy in the world that had some decency. She bathed often, for starters, a stark contrast to her ancestors. Conflicts began to arise as Vyniris entered the final stages of adolescence. A mouth far quicker then her brain led to a penchant for sass that quickly put a strain on her relationship with the clerics. When livestock began to go missing from nearby villages, they abandoned her entirely, casting the beast out on her own. A young boy was found dead the next day, and Vyniris was falsely given the blame. Dangerous Dave, sent for to clean-up his mess, began hunting her only to figure out the real culprit was a werewolf. Togather they cleared her name, and the young harpy has been at his side ever since. She's fast on her talons, and a charmer in the taverns, though never one to rely on in a fair fight or a contest of wit. If you need a good spy, a terrific ambusher, or a swift messenger, however, she's your gal. Just keep an eye on your cow. Claws: Melee Weapon Attack:*+3 to hit, reach 5 ft., one target. *Hit:*(2d4 + 1) slashing damage. Club:Melee Weapon Attack:*+3 to hit, reach 5 ft., one target. *Hit:*(1d4 + 1) bludgeoning damage. The harpy sings a magical melody. Every humanoid and giant within 300 ft. of the harpy that can hear the song must succeed on a DC 11 Wisdom saving throw or be charmed until the song ends. The harpy must take a bonus action on its subsequent turns to continue singing. It can stop singing at any time. The song ends if the harpy is incapacitated. *Class feature doubles this proficiency bonus. Last edited by NorthOfOrdinary; 12-31-2018 at 02:43 AM. I mean.... I can play a flumph in this game feasibly. I kinda gotta at least apply. Background: Francis was a small Flumph when he met Dave. Young and precocious he was always getting into trouble in the underdark. His cloister honestly had no idea what to do with him. He loved to explore and become something of an expert on where to find all the coolest stuff in the underdark. His sidekick story is pretty straight forward. He was floating around the underdark all irresponsibly when a roper attacker him. Caught in the creature's tentacles he was almost eaten until Dave showed up at the last moment, like he does, and slew the abberation. Francis was so overjoyed that he took Dave back to his cloister. Where they were more then happy to assist Dave in his quest. To find a very specific strider cobbler. Francis acted as Dave's guide for the adventure knew that this was the life for him. His cloister knew it was best for him and sent him on his way with well wishes and promises that he would always have a home to come back to. Francis quickly became quite helpful to the Dave. He was smart and stuff and even knew how to cast spells like a cleric. His hobbies include: reading, floating around peoples heads, glomping on peoples heads, glomping inanimate objects, dancing, putting on light shows with his glow appendages. Appearance: Imagine a small cute flying jellyfish with big googly eyes. That is Francis. Last edited by mjb; 12-29-2018 at 10:13 PM. Backstory: Dangerous Dave wanted a new suit of magic armor. He could of bought it from the Famed Wizard Wylie the Super-Genius. However, Dave was a cheapskate and went with Ecma the Discount Enchantress. Dave was really excited when Ecma was finally done. When Dave went to put on his new armor, he was unpleasantly surprised that the armor slapped his hand. Try as he might, he couldn't put on his new armor cause it continued to slap, nudge and shrug him off. Disheartened Dave finally gave up on putting the damn thing on. To make matters worse, when he left the room, the confounded suit started walking and following him. No matter where he went, it followed. Dave was not pleased at this at all. However, the first time he went into battle he was ecstatic when the armor charged into battle alongside him. Dave decided to call his animated armor sidekick Tin Man. Tin Man evidently did not mind the name as it did not slap Dave. They have had a few adventure's together. Tin Man wasn't so happy that Dave has left him behind with the rest of his sidekicks when he answered Mysterious Madam Quazzirel's invitation. But heck, he'd be back in the morning so all is well in the world. Or is it? Languages - Understands Common but can't Speak. Proficiency	with shields, simple and martial weapons. The armor is incapacitated while in the area of an anti magic field. If targeted by dispel magic, the armor must succeed on a Constitution saving throw against the caster's spell save DC or fall unconscious for 1 minute.Antimagic Susceptibility. 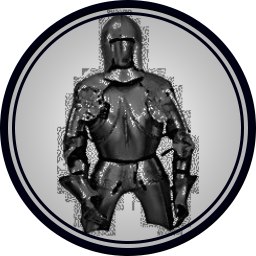 While the armor remains motionless, it is indistinguishable from a normal suit of armor.False Appearance. Starting at 1st level, the sidekick can use a bonus action on its	turn to regain hit points equal to	1d10	+ its	level in this class. Once it uses this feature, it must finish a	short	or long rest before it can use it again. Slam. Melee Weapon Attack: +6 to hit, reach 5 ft ., one target. Hit: ld6 + 2 bludgeoning damage. Melee/Thrown Weapon: +4 to hit, reach and damage by weapon type. Missile Weapon Attack: +2 to hit, range and damage by weapon type. Last edited by MIniSchnauzer; 01-04-2019 at 07:18 PM. Question... even though it does not have humanoid in its stat block, would I still gain weapon prof as a warrior due to being a humanoid-like construct? If not, no biggie. RAW, no. You are a construct, not a humanoid. But, you're a construct that looks like a humanoid, with hands that have opposable thumbs and such, and we see suits of armor lining castle halls holding weapons all the time. So, in this case, I would think it would be appropriate to allow. Too bad I can't make animated gifs otherwise I'd do a dancing armor suit for a pic. Still a little uncertain of the rules. We basically just take the creatures from the monster manual and past the class features on top of the ones they already have in the manual? Backstory: Five years ago fishermen off the coast of Fishermanland pulled up a giant octopus and put it up for auction, the winning bid (fifteen silvers!) came from a mysterious figure in a hooded cloak; Ruthless Rob, evil Wizard. Rob rocked back his head and uttered an evil laugh as the auctioneers gavel fell. "The world will be mine!" he cackled, wheeling away the mollusk on a hand truck. Rob cackled all the way back to his evil lair in the mountains (which was a rather long way to cackle) where he plopped the octopus into giant fish tank and began to chant. For hours the wizard chanted, hours! He didn't even stop for a drink of water or anything, and Podrik started to notice a change coming over him, for example, he realized his name was "Podrik". He realized some other things as well: words besides "Podrik" such as "fish" and "eat" and "want" and soon all the rest of the words too. "It's alive, it's alive!" rasped Ruthless Rob, throat quite sore from chanting for eight hours. "Well, I was alive before." Podrik corrected. "It's pedantic! Creature, you are going to do my bidding! You shall heed by every command without question or complaint! No task will be beneath you! You shall live in squalid conditions with no compensation! You shall endure cruel and inhuman treatment! You will be degraded, discouraged, and disenfranchised! You shall be... my intern!" "I mean, sure, okay. Can we talk about benefits and long-term..."
"SILENCE FOOL!" Rob screeched, and zapped Podrik with a corrective bolt of lightning. "You will begin by brewing me a Potion of Awakening! With cream and two sugars!" And so began Podrik's enslavement at the hands of Ruthless Rob. It went on like this for years, Podrik doing menial tasks around the lab for Rob, getting zapped whenever he made a mistake or sometimes just when Rob was feeling particularly ruthless. Rob refused to give Podrik any on-the-job training, but Podrik was able to sneak a peek into his spellbook here and there, practicing his spellcasting when Rob wasn't looking. He never got very good at it, but what do you expect? In the meanwhile he had learned to make the Potion of Awakening just the way Rob liked it, which seemed to be his primary function. Most importantly, he learned when Rob was in a very bad mood. Then one morning Rob was in a very bad mood. "Foiled again!" he screeched, looking around to zap Podrik who was already hiding behind a pile of orbs. "Damn that Dangerous Dave!" Rob kicked over a cage, and laboratory rats skittered everywhere. "The fool thinks he can defeat me? Fool! I'll set a trap, yes, a deadly trap. Full of... of... death! Yes! I will destroy him once and for all!" And so he began to work on plans for his Deadly Death Dome. Well accustomed to his master's mood swings, Podrik knew it was safe to emerge, and that Rob probably wanted his Potion of Awakening. "Podrik!" he soon hollered "Get me my..." but Podrik had already made it, and set it on his desk wordlessly. As always, Rob said not a word of thanks. Days later, Dangerous Dave walked bravely into the Deadly Death Dome and became trapped within. "Fool!" Rob taunted, "There is no escape!" cackling maniacally as Dave faced off against monster after monster inside the dome. He was dangerous, that's for sure, but he couldn't last forever, and escape was impossible. Or was it? Because Podrik had seen all the plans, and he was pretty sure he could get him out of there. And so Podrik did the one thing he knew was the point of no return, the one thing Rob would never forgive, the thing that would earn him days of torture and an agonizing death: Podrik made decaff. Rob collapsed onto his table mid-cackle and Podrik lept (well, oozed) into action, pulling open the cleaning hatch on the Deadly Death Dome and breaking Dangerous Dan free. "Thank you, mollusk!" Dave said, and Podrik felt a warm glow inside him the likes of which he had never before felt. At that moment, he knew he would follow this man anywhere. And he did, first following Dave over to Rob's desk where he was still passed out. Dave shook him awake, then yelled "It's over Bad Bob!" as he punched him in the face. "Argh, physical injury, my only weakness!" hissed Rob as he crumpled to the ground. "Again, I saved the day!" Dave congratulated himself "And you helped." He wrapped a manly arm around Podrik. "What's your name, Podrik?" "Have you ever thought about being a sidekick, Podrik?" "Alright, well can we talk about benefits and long-term..."
"Great!" Dave shouted "Welcome to the team!" Last edited by Phil; 12-31-2018 at 09:20 AM. For example, I chose Animated Armor. It can't talk originally. So it can only take warrior sidekick class as you need to start with a language to be an Expert or Spellcaster. If you were to take a twig blight as a Spellcaster, it couldn't cast spells with a verbal component. While it originally understands Common it can't speak as per its stat block. Last edited by MIniSchnauzer; 12-30-2018 at 08:11 PM. Backstory: Oh yeah. Dangerous Dave and I go way back. Well, I mean, maybe not as far back as some of the others, but a few years, at least. That's a long time for a Kobold, you know. Dave rescued me from some ogres. They kidnapped me from my clan, after killing about half of them and taking most of our stuff. Oh - no - it's ok. My clan was awful. They treated me like dirt - 'cuz of the wings, you know. So, I don't miss 'em none. Well, maybe Geolf. He was alright. But the rest of 'em - good riddance. They kept me in a cage, the ogres. Called me "little birdie" and made me sing to get fed. I guess it wasn't so bad, really. I got free meals. Actually, I could get out of the cage if I wanted; Ogres aren't good at building cages. So, sometimes, when they were asleep or out hunting, I'd slip out and stretch my wings. But I came back. The food wasn't bad, and I'm not one for goin' it alone. It's a kobold thing. But then DAVE showed up. Wham! Pow! Oh, yeah! He was magnificent. While I watched the fight, I thought to myself, "that guy's the real deal." So when he released me, and decided not to kill me, I just had to ask if I could join him. He already had a few other helpers, so I figured it was worth a shot. And, again, I'm not one for goin' solo. And you know what Dave said? "Well, Flappy," - he calls me Flappy - "Well, Flappy. I don't see why not." Just like that! So, yeah. Dave's my guy. These are his initials on my armor: D. D. Dangerous Dave. The thing is... he doesn't pay us that well, and I'm not sure where he is right now. So, you think maybe you could give me a discount on this ale? Last edited by timplausible; 12-31-2018 at 01:12 AM. Appearance: Khuzo is on the short side for Lizardfolk, being a bit under 6 foot in height. She wears pieces of clothes, just to show she's civilized n' all, but she won't really care if they fall off. Aside from that she wears just the leather straps and belt to keep her simple belongings. She has a long thin quiver with several javelins in it as well as a simple dagger and a heavy club. She doesn't wear armor. Background: Khuzo was the runt of her clutch, and she doesn't remember this, or just simply cares not to as is the mindset of most of her kind. After clearing out a warren of lizardfolk who were threatening a village, a clutch of eggs was brought to the local Inn to be cooked. When it came time for dinner, the cook found that the clutch of eggs had hatched into a half dozen snapping, hungry, and sick little bipedal lizards. It was decided by the community to try and nurse them to health, but they all died save the runt. Named Khuzo because of the coughing noise she made, she was at first seen as a pet. Soon, it was realized she was sentient, and intelligent enough to be raised more like a humanoid child. Two years ago, Dave happened along and saw how she was being mistreated as a dishwasher and general flunkie at this Tavern. Feeling that he may have had a hand in slaying her kin back in the day, he decided to take her someplace else. No one wanted her, so he decided to train her to fight for herself as she listened only to him due to his freeing her from a life of sleeping in a cage when not working. Over the past half a year, neither she nor Dave had brought up her finding a new home, and she had become his sidekick, or follower. She'll find him at all cost. Last edited by Drachenspirit; 01-03-2019 at 01:33 PM. Sounds interesting. Won't the group basically be an adventuring party though? It will follow around PC on his adventures, but they'll all have class levels and abilities and obviously be trying to keep him alive. Death Dog or Pseudodragon look good at first glance. Will Pseudodragon invisibility be too OP? Question for fearless leader: could the Alter Self spell be used to invert the Aquatic Adaptation use? IE, giving an aquatic creature the ability to breathe air and a walking speed equal to their swimming speed. Also, how many draft horses would it take to pull a wagon with a 10/10/10 aquarium? I found this site for the weight of a tank with water. 10 foot x 10 foot, with water, would be around 66 thousand pounds!